The biggest fruitings of king boletes I've ever seen haven't been in the Pacific Northwest. No, the Rockies own that distinction, in particular the high montane reaches of northern Colorado. We visit this region every year to see family. I can think of three separate occasions when I've hit the porcini jackpot dead-on. The first was a solo backpacking-fishing trip on the Colorado-Wyoming border that gave me my first inkling of what the Rockies could do from a mycophagist standpoint; the second an all-day singletrack mountain bike through high meadows not far from a gap in the Gore Range where the Colorado River punches out of Middle Park; and the third this week southeast of Steamboat Springs. I don't visit the Rockies enough to have firm beliefs about the mushroom hunting possibilities here, but this is what I've gathered so far. August is generally the month to check your porcini spots. If it's not a drought year and normal patterns of afternoon showers prevail, start looking a few days after the rains start. Go high. Get above the lodgepole pine forests into more mixed coniferous forests, especially spruce. Here's a shot of a "king with a view" just below an 11,000-foot pass in the Zirkel Wilderness. A mushroom hunter from Seattle would be forgiven if he was confused by the taxonomy of these kings. Though clearly an edible form of bolete with its white pores (in young specimens) and faint pink netting on the stipe (reticulation, in the parlance), these kings routinely exhibit much darker caps, sometimes a deep wine-red, that contrast sharply with the tan, sometimes pale caps of Cascade kings. 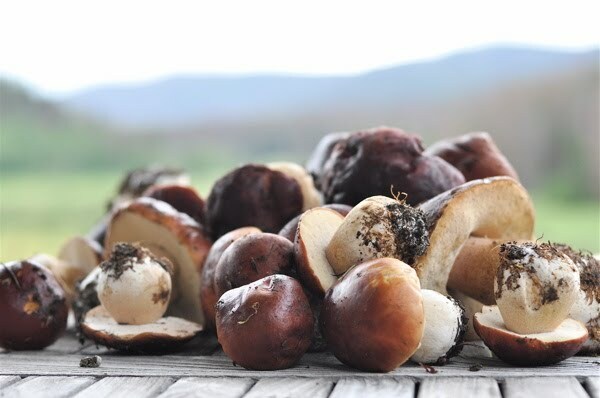 Still, they are currently classified as the same species as the world-renowned kings of Italy, the Pacific Northwest, and elsewhere: Boletus edulis. The taste, though mushroomy and choice, might not be quite as nutty as Cascade fall porcini. 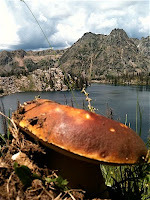 Which brings me to my main question: Why the lack of a commercial culture surrounding this mushroom in the Rockies? Is the territory too remote? A lack of demand? Is this subspecies of king considered inferior to other varieties and therefore not sought after? I've never seen another pot hunter around here, never a buy station, never encountered that bane of the Northwest mushroomer: the cut stem. Maybe we're far enough from Denver here to escape the competition. To the south of me, in the pine forests of the Southwest, there's another king bolete (currently classified as its own species) that some say is the best tasting of all the world's porcini: the white king bolete, Boletus barrowsii. Supposedly it fruits earlier than other kings. One of these years I'll make a roadtrip in July to suss out this hallowed variety of porcini. In the meantime, I'm loving my quietly regal Rocky Mountain kings. Oh how wonderful to be able to gather those wonderful porcini. Tasty looking boletes! Looking forward to the fall flush. I've found B. barrowsii in Northern CA before, they honestly did not taste different than the kings I find under live oak in the fall. I think both of these have more flavor than those growing under pine though. Nice CO finds! I would love a few fresh boletes, sometimes the dried ones just don't cut it. Those are beautiful! I've never taken note of the mushrooms, but I think I will have to from now on. Update: My boy has demanded a porcini omelet for breakfast and dinner every day for the last three days in a row. Good times. Jeffrey - Tell me more about Yukon kings...are they spring kings (Boletus rex-veris)? Boletovores unite! Perry - A friend of mine swears he finds B. barrowsii under the same tree in Seattle every summer. I've never seen it in the PNW, or anywhere else for that matter. Avenger - Thanks for the visit. Definitely take note. There's an entire kingdom awaiting discovery. Hey, I did a post about the Yukon kings a couple of weeks ago. 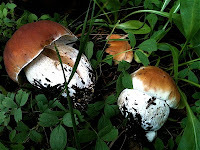 see here ---> http://nose2tail.blogspot.com/2010/07/yukon-porcini-season.html Not spring kings or borrowsii. Color from reddish orange to almost buff/off white on sun affected ones. Very nutty and meaty. Worm free for the most part. Growing around birch, aspen, alder, dwarf birch/willows and white spruce. In troops with amanita muscaria. I cant get enough! Here in so CO we find the barrowsii at lower elevations (8-9K') growing under Gambel oaks. 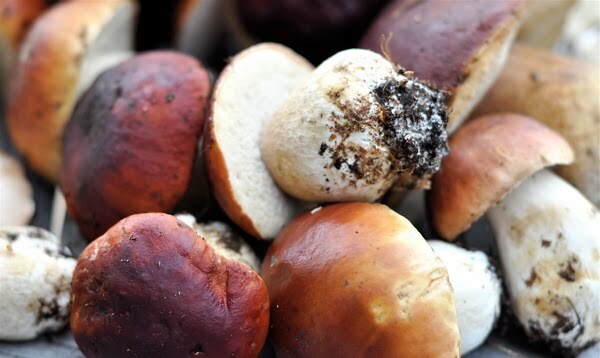 They are my favorites of the boletes! If you try to hit the barowsii, don't go in July, wait until August when the rains are well into their cycle. We hit a bunch a week or two ago, as did Steve Bodio south of us and Chas Clifton in the southern Colorado Rockies. Interesting that there appears to be less porcini-mania there. 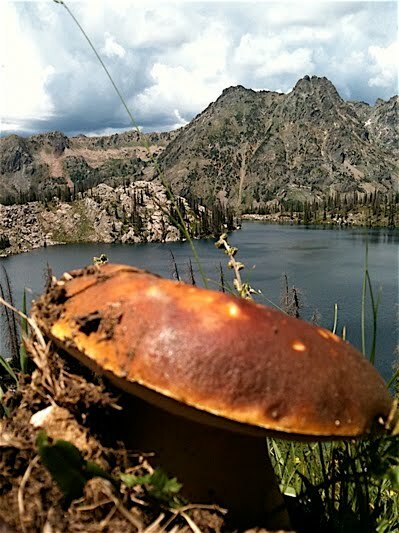 I know Steve Bodio just blogged about hunting porcini in the Southern Rockies (click here and scroll down to the Aug. 8 post). Lovely images. Looks like you had a great day. You inspired us to go hunting. We were on the Western Slope (near one of the areas you mention) yesterday and gathered 50 pounds of these beauties. I must say, there were cut stems, elk foraged caps, and there were quiet hillsides offering bounties of these lovely wine-red boletes. Thanks again for the nudge and all the great info you provide. Nice haul! You need to have a porcini tasting someday, to see if you can discern the flavors of all the various types. Guess you'd need to do it with reconstituted dried ones, though. When is fall porcini season up your way? Porcini may be an Italian word, but the northern Europeans seemed to take their mushrooming more seriously.